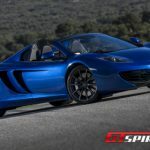 Performance is always going to be a big factor in anything that McLaren produces, which is why the press introduction for the 2013 McLaren 12C Spider took us to the Ascari Resort in Spain. Thirteen right and thirteen left hand corners make up a five and a half kilometer track, a perfect test for any new McLaren model. Most 12C Spider’s won’t get to see the track though. This is where Ascari’s location comes into play. It’s an hour away from Marbella, an established mecca for wealth and fame, nestled in the foothills of the mountains outside Ronda. The perfect test for the Spider’s cruising, road handling ability and feel. The 12C coupe has been on the market for over a year already. For many, its reliance on electronic wizardry makes it a clinical option. The coupe is a hugely fast and very capable supercar, yet some believe it lacks the passion of its Italian rival. 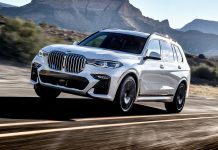 We set out to find out if removing the roof injected a bit more flair to what we already know is an incredible package. The 3.8 liter twin-turbocharged V8 engine gets the 12C’s 2013 updates. It now features 625hp and 600Nm of torque which makes for a zero to 100km/h time of just 3.1 seconds, exactly the same as the coupe. To 200km/h it takes nine seconds, which is 0.2 seconds slower than the coupe. Top speed is 3km/h short to the fixed roof 12C at 329km/h. The running gear is exactly the same too. The transmission is a seven-speed dual clutch unit which receives the 2013 mapping, designed to increase shift time and responsiveness. Compared to the 2012 model, the Spider feels very crisp with power available on demand. As you would expect with a dual clutch system, the shifts are instantaneous. 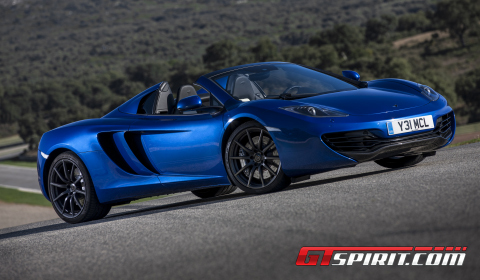 The 12C Spider also features the same carbon fiber MonoCell chassis as the Coupe. The complete cell weighs just 75kg and was designed with the convertible model in mind so McLaren didn’t have to strengthen it in any way. The folding roof mechanism simply adds 40kg of weight to the overall package. 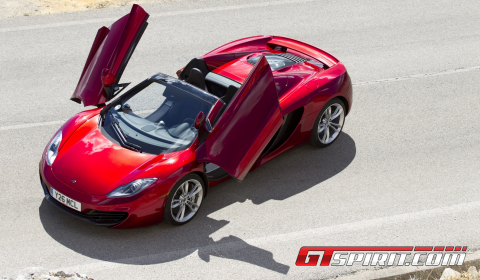 Compared to the competition, the 12C Spider’s mechanism is extremely light. With most performance cars the Spider variants add a lot of drawbacks in terms of both practicality and performance. The 12C Spider sets out to be different. The reduced luggage space is addressed through additional storage space under the tonneau when the car is driven with the roof up. Every 12C Spider comes with two specially designed bags that can be used to make use of the space available. You would also expect a convertible to have reduced interior space but in fact the 12C Spider offers a slightly improved headroom due to the higher roof line. The seats won’t move as far back as in the coupe but that won’t be an issue for average drivers up to 6’2. The seats no longer move as far back as they used to but we didn’t find this to cause any problems. The 12C Spider also gets a different rear window system too the Coupe that can be dropped with both the roof up and down. With the roof up it allows for undiluted engine and exhaust sound to fill the cabin with a lovely tune. 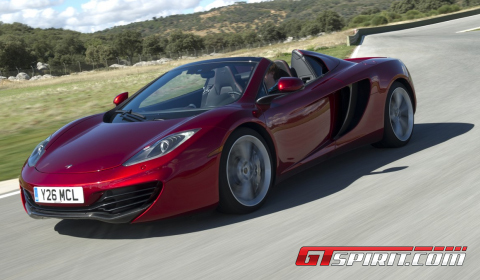 This alone is reason enough for any potential 12C buyer to opt for the Spider over the Coupe. Yes, this comes at a price but the Spider adds so much over the Coupe that in many customers’ eyes, it will be worth the extra £15,000. Talking about the roof, it’s a lightweight, ultra thin retractable hard top made from the same composite material that McLaren use for the 12C’s bodywork. It folds back and drops one panel vertically and the other one horizontally on top in the area underneath the tonneau. The whole cycle takes about seventeen seconds and it can be completed at speeds of up to 40km/h. Go above that speed and the system will pause and ask you to slow down. 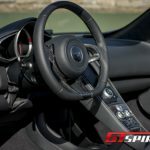 The 12C Spider has something else that makes it stand out from other convertibles on the market today; it has a tiny glass panel that displays a section of the engine. Because the roof panels fold down in two pieces directly behind the drivers seats, McLaren had enough space to leave the engine exposed for everyone to see even with the roof down. Next to the 25hp of additional power, the 2013 upgrades offer a wide variety of new features. The engine noise inside the cabin is now programmable through the unique Intake Sound Generator with three different settings. The headlights are now linked to the rain sensors when in automatic mode and an easy-exit electric seat with a memory function is now on offer. Finally, a new Meridian audio equaliser setting is available too. An ‘AUTO LO’ function will be added to new cars allowing the desired cabin temperature to be reached in the quietest way possible. While driving the 12C Spider through the mountains up from Marbella you realize that it redefines what you thought would be possible from a convertible. The sheer levels of grip, the insane acceleration, the sensation of the open top experience and all of that with a stability and ease we’ve not experience before. Often looking at the speedometer you cannot believe the speeds you are doing through corners and even on bad road surfaces. The extremely rigid carbon fiber MonoCell and McLaren’s ProActive Chassis Control make the big difference here. Regardless of your setting the system adapts beautifully to the road conditions and body movement. 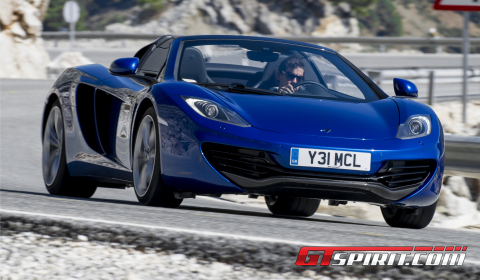 The potential of the 12C Spider is probably best illustrated by the hot laps on the Ascari circuit. It provided us with the ability to try out different suspension and powertrain modes and the impact on the cars on-track performance. 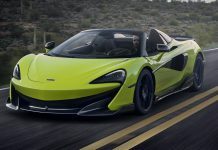 The experience was thrilling, flying down the back straight of the Ascari circuit in a convertible at over 230km/h, a speed most purpose built non-convertible sports cars will struggle to achieve shows the 12C Spider’s versatility from daily driver to track toy. The 12C Spider is equally at home travelling through town though. The suspension is compliant over rough road surfaces and the width fits well down side streets. While some will still find the design a little bland, they can’t argue it has presence. It grabs your attention as it goes past and the doors are a masterpiece. Heads turn and cameraphones are out everywhere you go. The interior is very similar to the 12C Coupe interior, although our Spider test came with a few new 2013 options, also available on the 2013 Coupe. One of them is the nose lift, if you use the car as a daily driver this will help prevent any embarrassing scraping moments when driving the car around town. Parking sensors also provide some comfort for the customers who like to use it as a daily driver. Both system work well as you would expect. The final option we hadn’t tried on the 12C Coupe before was the navigation and entertainment system. The audio adapts whether you drive with the top up or top down. The navigation system uses the portrait shaped touchscreen in the center console, but wasn’t without its flaws. It froze a couple of times while we were using it but McLaren assure us it will be fixed by the time owners take delivery in January. Overall the quality of the interior is top notch and all the controls are within reach and operated with ease of use in mind. The 12C Spider is a killer machine that offers the best of the Coupe with a range of additional features that take the convertible driving experience in this segment to a new level. Even if you don’t like convertibles at all, we would still opt for the 12C Spider over the Coupe. Even if it was just for the rear window alone, that lets in the beautiful exhaust tunes and turbo woosh created by the twin-turbo V8 engine. The first 12C Spiders will see customer deliveries starting Q1 2013. 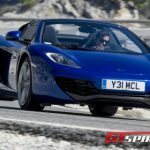 Right now the waiting list is around six months but with the media test drives being released now and the outstanding package the 12C Spider offers we expect this to increase quite a bit over the next couple of months.